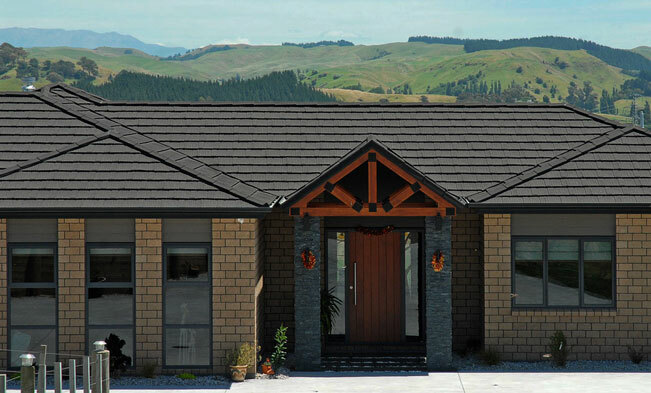 Metalcraft Roofing produces the Shake Metal Tile profile which is available in both pre-painted and stone chip finishes. These Tiles complemented by a range of flashing and trim options provide a quality finish to any dwelling. Metalcraft Shake Tiles offer a defined look, especially in the stone chip finish. With installation and material warranties to match, Metalcraft offers the customer unparalleled security and peace of mind. Metalcraft Metal Tiles are designed to withstand environmental extremes so they afford considerable peace of mind. The interlock and overlap panels unique to metal tiles are secured in place with a horizontal fixing system. Fastenings are situated at 90 degrees to the tile surface providing resistance to wind lift from hurricane force winds and earthquakes. They are also highly resistant to storm damage in the form of hail, and although they may dent, they will not crack or leak as a result of hail contact. A typical lightweight metal tile weighs just 1/16th of the weight of a conventional tile. This reduces the amount of timber required to reinforce your roof trusses providing a considerable cost saving in design and materials. Metalcraft Metal Tiles are manufactured from the base core of Zincalume® steel. Our colour range is produced from a proven paint system supplied by NZ Steel which gives excellent colour retention and is suited to most urban and coastal areas.